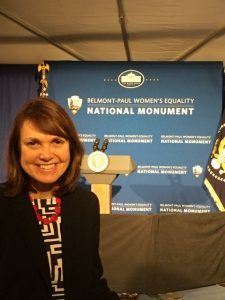 On April 12, 2016 President Barack Obama announced the establishment of the Belmont-Paul Women’s Equality National Monument in Washington, D.C., at the Sewall-Belmont House & Museum, home to the National Woman’s Party for 90 years, and the center of the struggle for women’s suffrage and women’s rights. The Monument is now part of the US National Park Service. Women’s Suffrage Celebration Coalition President Fredie Kay (see photo at left) was present for the dedication ceremony and serves on the Monument’s 2020 Women’s Vote Centennial Initiative (WVCI). In addition to President Obama (see video below), speakers included Secretary of the Interior Sally Jewell, Senior Advisor to the President Valerie Jarrett, Delegate to the House of Representatives from Washington D.C. Eleanor Holmes Norton, Senator Barbara Mikulski, and US House of Representative Minority Leader Nancy Pelosi. The new designation honors both Alva Belmont, the National Woman’s Party benefactor, and Alice Paul, who founded the party and served as its chief strategist. Obama made his announcement on Equal Pay Day, observed on the day that reflects how far into the year women have to work in order to equal the pay earned by men the prior year. Created in 1996 by the National Committee on Pay Equity, it is designed to increase public awareness of the gap between the wages of men and women.